David Tuck is a survivor of World War II. But unlike many of the aging veterans of that era who are rightly hailed for their military service, Tuck experienced the six-year-long conflict as a civilian, a child, and – most importantly – a Jew. We met Tuck – who was a guest of honor at this years MAAM World War II Weekend – shortly after he spoke to the crowd about his life and the lessons he learned as a survivor of the Holocaust. BPE: Thank you for taking a few moments to speak with us today. Tuck: That’s why I’m here. BPE: To begin, what do you tell people when you meet them? Tuck: I tell them my life story. I had a rough life. My mother passed away six months after my birth, so I was raised by my grandparents. When I was eight years old, I met my father for the first time. I lived with him for two years, and then the war broke out. I went to the ghetto, then to a labor camp in Posen. If you look up Posen, you will see that a lot of terrible things were going on. I was there for two years, then I went to Auschwitz til early in1945. Then I went to Mauthausen. That’s in Austria, near Linz. I was liberated on May the 5th – that’s my birthday – so every year I celebrate my liberation. BPE: Do you ever encounter Holocaust deniers? BPE: In your talk to the crowd today, you briefly mentioned bullying. Would you elaborate on that? Tuck: When I talk to students, I tell them, if someone gives you a hard time, don’t say nothing. Don’t answer – just walk away. Tell yourself it’s their problem. They have a problem. 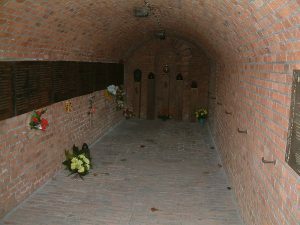 I also tell them I will never forget / never forgive what the Nazis did to me. But I don’t live with hate. People can’t understand. “Why don’t you hate them?” they ask. I tell students don’t live with hate. Hate will destroy you. I say to myself all the time, if I have to look at the number on my arm, it’s gonna bring back memories to me. I’m gonna live with it. So am I gonna look at that number and dwell on it? If I have to look everyday at my number and dwell on it, what’s that going to do to me? I don’t want to give (my persecutors) the satisfaction. If you are filled with hate, you only destroy yourself. So, when I speak to students, they listen to me. I go anyplace they want me to. As long as I’m alive, I’m going to continue to do it. BPE: Did all of the Jews in Poland get such a tattoo? Tuck: The tattoo on the arm – only Auschwitz gave out. 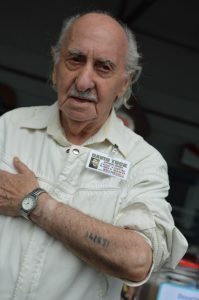 At each camp, I had a number, but only Auschwitz tattooed the number. And if you see somebody with the blue and white striped clothing, that was only in Auschwitz. At the rest of the camps, I was dressed in regular clothing. BPE: Why were uniforms and tattoos particular to Auschwitz? Tuck: Why was Hitler doing those things he did? Who knows? If they asked for names, there could be double at the same camp. The number was easier. BPE: What sort of reaction do you get when you talk to students? Tuck: After I finish, I will ask if anyone has a question. No one raises their hand. You know what I tell them? “When you go back to your class, you will have questions.” So guess what happens? They start to raise their hands. One thing I do ask is that they write me an essay. The teachers are not going to grade them, but I look through everything. If it is good, I will see it is published. I don’t ask for the students’ names. One student just sent me something, and I’ve got to tell you, it was a beautiful thing. I wish I had a copy here with me. But I am happy to share my story with anybody. Someone just asked me to go to Chicago. They are sending me the plane tickets. Another young woman found me on the internet. She is a freshman. She called me up and asked if I would come and speak at her school. Guess what – a thousand people came to hear me speak. She even sent a little limo to pick me up. All they have to do is ask. People ask me so often, I could be speaking 6-7 days. But I’ve made a commitment. As long as I’m alive, I will do it. BPE: They say history repeats. Do you see some of the same things going on today that you saw in the 1930s/40s? Tuck: No. I know what’s going on with kids today, and it’s a disgrace; but look, there is always gonna be somebody hateful. Nothing in life is perfect. Remember in the spring, they were marching in the South with the Nazi flags and swastikas? They were carrying signs: “JEWS LEAVE AMERICA”. That really got to me. At least they said, “LEAVE”. Hitler did things differently. Hitler killed them. BPE: One of the phrases most commonly associated with the Holocaust is “Never Forget”. But you add “Never Forgive.” Why? How will Sen. Kamala Harris’ record as a prosecutor play with progressives? ← National Éclair Day: How could I miss it?